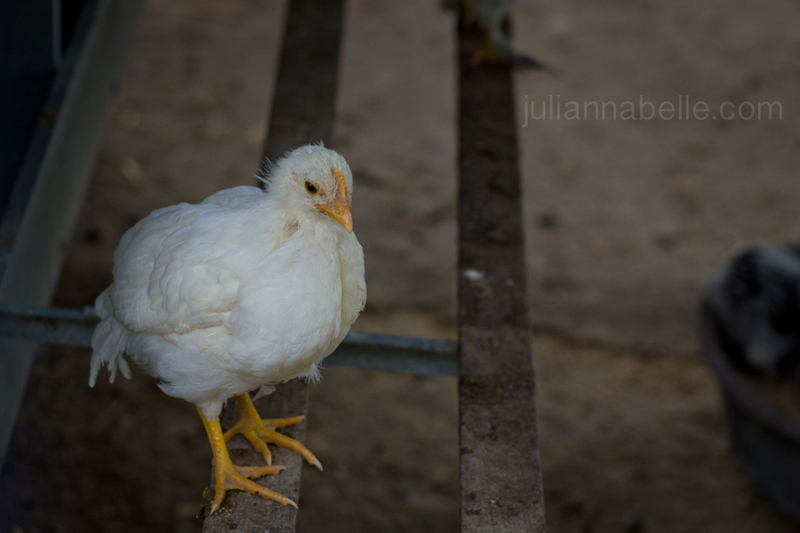 Last weekend, we went to a local farm by us called Donaldson Farms. They have "Family Night" every weekend during the summer where they offer a delicious chicken & ribs dinner with fresh potato salad, homegrown corn & salad for $15. Everything but the meat is from their farm. You order at the outdoor counter, and then you either go to a picnic table or set up a blanket in the grass, and someone brings you your food. Oh and they have the best milkshakes too! Julianna stole my milkshake and finished it off.... she wouldn't give it up. After dinner, there are a ton of kid's games, a petting zoo, a band playing, and a hayride out to the fields to tour where they grow their produce. 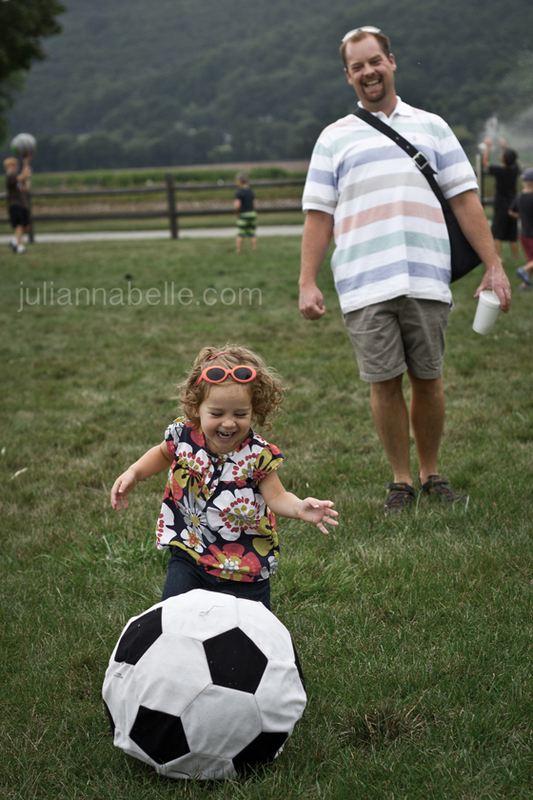 Julianna loved the hayride and loved the giant soccer balls that she got to kick around & throw. 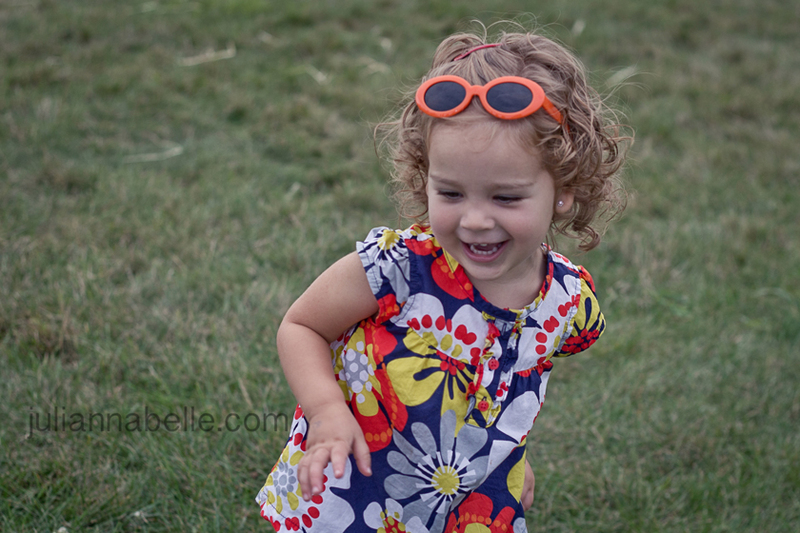 We had such a fun family night at the farm! There she is with my her milkshake. 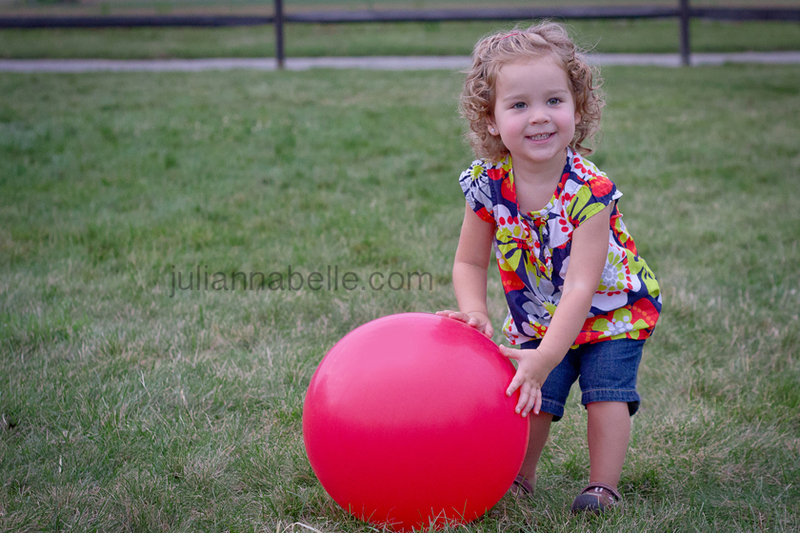 Julianna loved this big red ball! I didn't ask her to pose here! She just does it on her own! These piggies were running back & forth playing - so adorable! Julianna loved the piggies! They had so many baby chickens. So cute! I dread the day she makes the connection that these cute chickens are what she eats for dinner. Bummer. Running like the crazy kid she is! 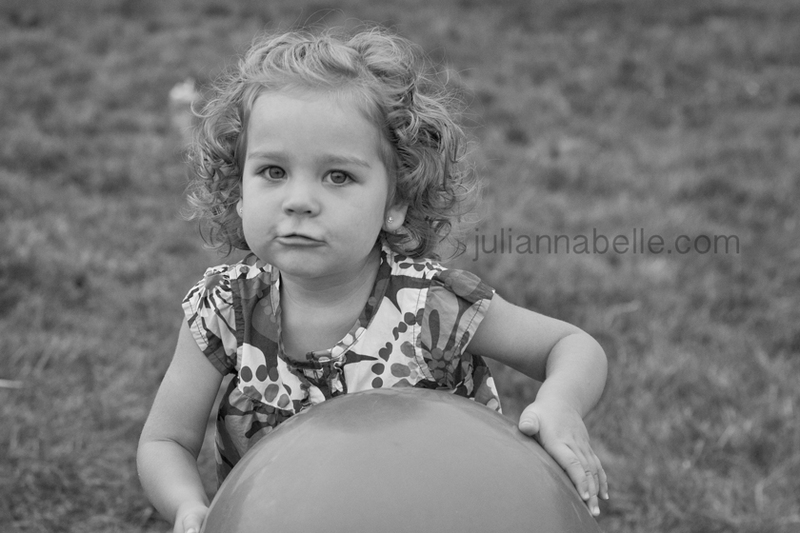 She loved this soccer ball! Getting tired at the end of family night. Summer is our favorite time of the year. 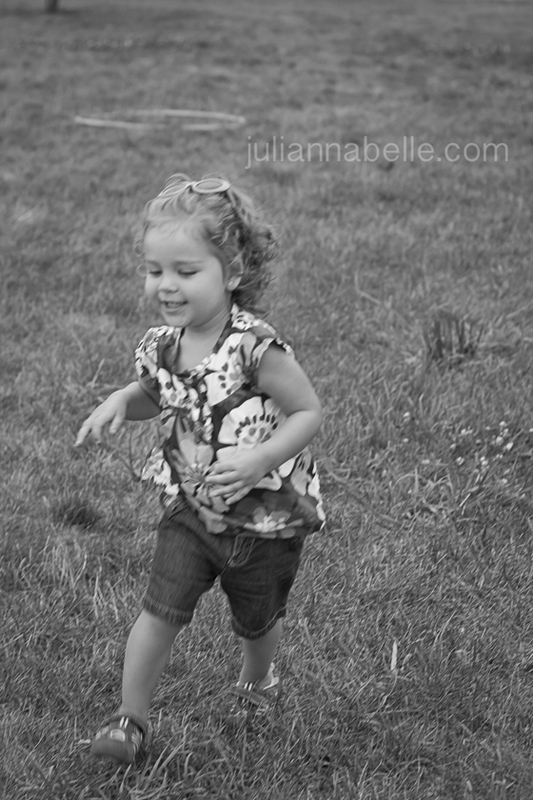 We love doing all the outdoor things that we can with Julianna. We'll be going back for family night at the farm soon enough! p.s. this is what my dog loves to do in the summer. She loves to lay on the cushions out on the deck bench and take in the sun. What do you do with your family in the summer that is fun for everyone? I didn't know this about Donaldsons. Cute idea. Thank you Kim!! Yes Donaldsons Family night was just discovered by us this year. I used to live in Hackettstown, and it was just a small farm stand then. Now it is morphed into this huge place with a 'small farm' feel to it. We go there for their farm market and strawberry picking, etc! So much fun! And now family night too! OH. LOVE. THESE. ALL of the, but the daddy & little girly shot is PRECIOUS! You always take such lovely shots Skye! 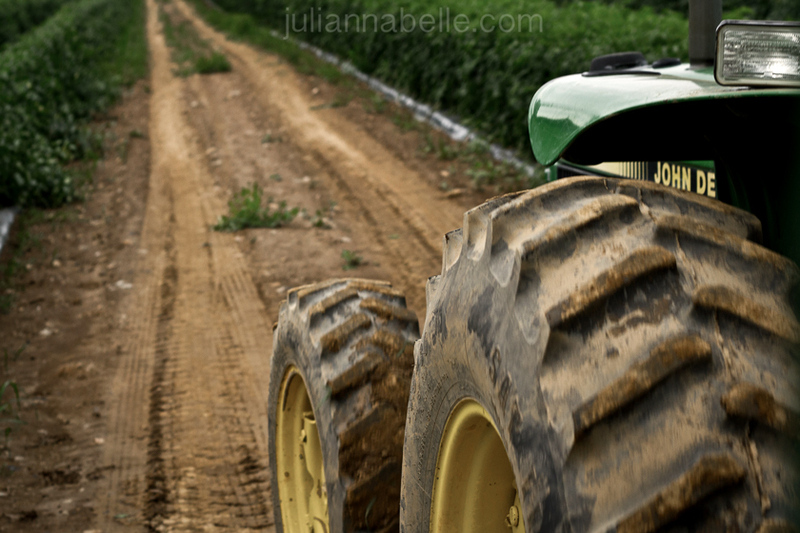 That farm seriously sounds like the best place on earth. How cool dude! My problem is not enough time to do it all – so we have to narrow down – haha! Family night was fun - I am so glad we are able to find all this fun stuff to do by us - we have a great website called "FUN IN NJ" and it has all this local stuff listed plus I follow them on Facebook, so its easy to see whats coming up for the weekend! 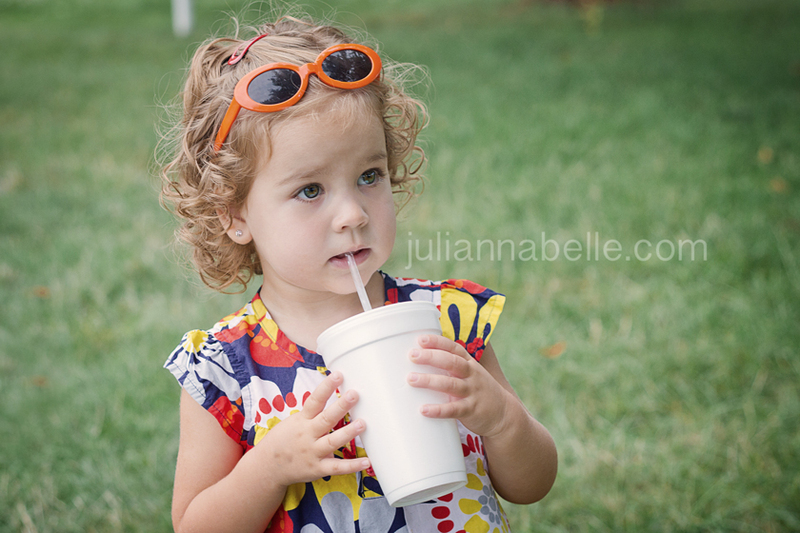 Love that she stole your milkshake :) Family Night at that farm sounds like so much fun! I'm so ready for Fall so we'll have cooler temperatures and can get back to doing things outside without being drenched in sweat! Yes she loooves milkshakes now. 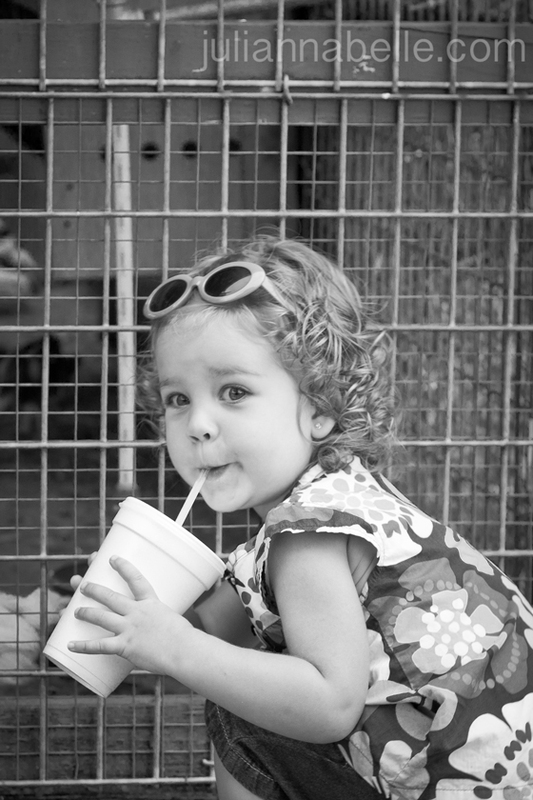 We got her her own milkshake at the fair this past weekend but she only drank a little bit. guess I should have just let her take mine haha! Yeah you guys have some serious heat by you ... it's been hot here lately but we try to go where there is water (pool, beach, etc) to keep cool if we can. We do get some break in weather this week - i think it's supposed to be in the 80's and not too humid - perfect summer weather. I Hope you get outdoors soon and have some fun and beat the heat!